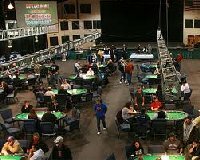 Little Creek Casino in Shelton, Washington has a 63,000 square foot casino floor with 1,000+ slot machines, 20 table games, poker, bingo, Keno and Hotel. Open Sunday - Thursday 9am-4am and on Friday - Saturday 9am-5am. Little Creek is a Four-diamond Resort Hotel with 190 rooms and amenities that you would expect. This is a first class place.